In the regular course of business, Portland Story Theater collects name, mailing address, phone number, email address, and the names of people who accompany you to an event. 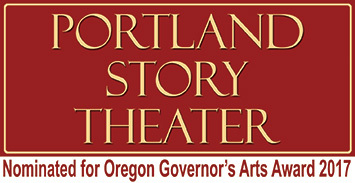 On occasion, Portland Story Theater may also collect information volunteered by you‚ such as survey information. You may purchase tickets, gift certificates, or a subscription to Portland Story Theater when you call our office, at which time you will be asked for your credit card number, expiration date, and address. Credit card purchases require a full mailing address. Additionally, credit information is stored and encrypted in the Portland Story Theater’s database. You can register with our website if you would like to receive our e-News. We plan to expand our website so that you can purchase items such as CDs, DVDs, T-shirts and other merchandise. Information you submit on our website will not be used to build our e-News unless you fill out the e-News registration form. Protecting the privacy of the very young is especially important to Portland Story Theater. For that reason, we never collect or maintain information at our website from those we actually know are under 13, and no part of our website is structured to attract anyone under 13.